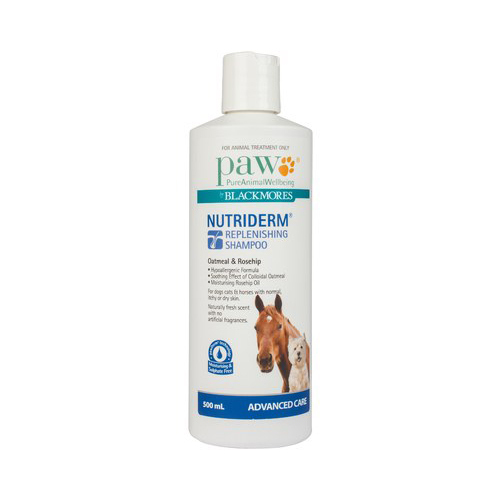 PAW NutriDerm Replenishing Shampoo is an advanced formula for rejuvenating dog skin and hair. Enriched with vital nutrients, the dog wash product nourishes dull and dry skin. It replenishes skin and coat without draining essential natural oils apart from hydrating and smoothing hair follicles. The unique formula is suitable for dogs with itchy, dry and normal skin. With advanced PawDerm technology, which includes cerasine – a skin nutrient complex, it repairs and nourishes skin. The fatty acids exclusively moisturises for optimal skin hydration and a healthy skin barrier. The other major ingredient colloidal oatmeal provides soothing effect. Moisturising agents detangles and leaves a soothing, manageable coat with refreshing fragrance. Wet dog coat thoroughly and apply shampoo. Massage and work up to lather. 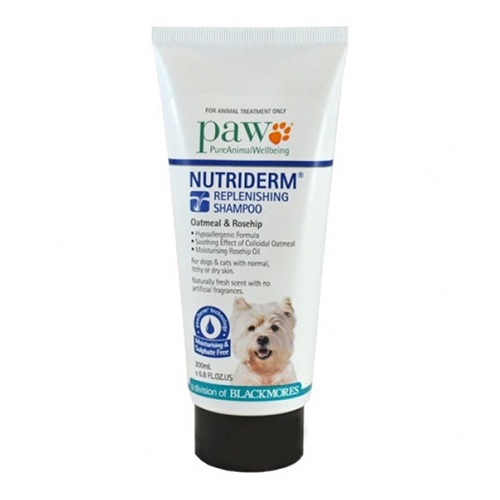 Follow with PAW NutriDerm Replenishing Conditioner. Hypoallergenic, sulphate and soap free formulation for gentle cleaning of dog skin. The unique formula offers soothing effect while treating itchy, extra dry skin. Added vitamins help skin repair damaged cells and make new healthy cells. With no harsh chemicals, it is safe to use on pet skin. It replenishes skin and coat enhancing overall skin health. Ingredients Purified water, surfactants, glycerinn (vegetable), oat kernel flour, stearyl citrate, carrageenan and glucose, emollient, sorbitol, panthenol, sodium gluconate, sodium citrate, sodium hyaluronate, sodium hydroxymethyglycinate, rosa canina seed extrate. This shampoo enhances the overall skin health in my poodle. His fur has become pretty smooth now. I recently switched my pet's shampoo with Nutriderm. Have hardly used it twice but I can see his fur has become softer than before. It was only a few days ago that I was browsing through the net to find an apt shampoo for my pal and here it is now applied on him. Thanks vetsupply for such swift delivery and a well-written description of the product. A very mild shampoo that has a nice lather.